The recent news that the government intends to ban wet wipes, as part of the fight against single use plastic, has caused quite a stir. As a society built on convenience, these wipes have become somewhat of a ‘necessity’ and many people have struggled to acknowledge there could be a better alternative. It’s not just parents who rely on wet wipes, but people who use them for a whole host of other reasons; removing make up, cleaning furniture, washing floors, and so on. Wet wipes are having a huge impact on our environment, ecosystems and marine life. Huge floating ‘fatburgs’ are causing sewer blockages where fat and wipes bundle together, costing the country millions every year. Conservationists report so many wipes along the riverbeds of the Thames that it is fundamentally changing shape. However, it’s not just the people who flush, as many seem to be blaming it on. Most wet wipes contain a high proportion of plastic resins such as polythene, polypropylene, synthetic fibres, and polyester, which are not biodegradable and spend years in landfill. For some people, cloth wipes simply aren’t a viable option. Therefore the government need to recognise the importance in investing in research and design of plastic free, biodegradable alternatives, giving clear guidance to both use and disposal. Cloth wipes are the perfect alternative to wet wipes, and it really isn’t as much work as you would think. What did our parents and grandparents use? Flannels and washable cloths for everything. What can you use them for? Here’s a few suggestions. Okay, so this may sound a little obvious but cloth wipes are the best thing you can use for sticky fingers and faces. They clean beautifully, contain no nasties and they actually remove the mess rather than smearing it around. One wipe and job done! Yes indeed, shock horror, cloth wipes are the best thing to use on little bums! Have them ready soaked so they are as convenient as wet wipes and keep in a wet bag, or just wet on the go. Either way, cloth wipes for bums are gentle, effective, and most importantly, kind to the planet. It can take multiple wet wipes to wade through a poonami, but rest assured, a couple of cloth wipes will have the job done in no time. So this one isn’t going to be for everyone but hear me out. Toilet paper is as much as a single use item as anything else, with good reason I hear you say. Many people around the world wanting to reduce their waste and environmental impact, have adopted a method known as family cloth to replace toilet tissue. Its clean, effective and very simple. It may not be your first port of call if you are new to the idea of cloth wipes, but perhaps if you already use cloth for some of the above, it might be worth considering. Using wet wipes for removing make up is somewhat expensive and unnecessary. 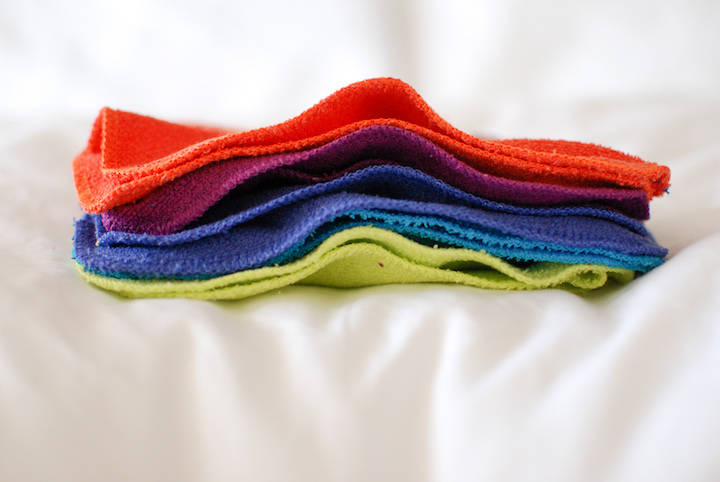 Using cloth wipes or cloth make up pads is such a simple swap to make, and will help you be a little bit more green around the home. In fact, it’s a great place to start your cloth journey if the whole business makes you a little nervous and bodily fluids send shivers down your spine. No mess, just clean, effective and kind to the skin. No nasties! Anything you currently use a wet wipe for around the home, can easily be converted to a cloth alternative. You can even just tear up old clothes or towels if you don’t have the funds to stretch to shiny new cloths for everything. A mix of upcycled and new is ideal depending on the purpose. What I do with Cloth Wipes? It really is very simple. Have a bucket or wet bag to contain the used wipes. It’s best to tie them in a mesh bag before putting in the washing machine (just like you would any small items). Then stick in the washing machine, either with other washing or towels. That’s it! If you want to avoid stains on any fabric, it’s best to do a cold pre-rinse. Fabric softener really isn’t needed, it builds up and reduces absorbency. You can find in depth washing guidelines here if you want more info. Fab post! So many options for cloth wipes substituting disposable ones! Will be sharing it now!